R is the radius of the Earth, H is your height and D is how far you can see. The walking distance across the Earth's surface is the length of the arc s.
Solution to problem 2: You see something, like a cloud or a hot air balloon, high in the sky beyond the horizon and you know its maximum possible height above the ground. Can you work out how far away it could be? Let's assume that the object is at the maximum possible height above the surface of the Earth. So in our two-dimensional view it lies somewhere on the circle of radius about the centre of the Earth. Since it is beyond the horizon, the object lies beyond (from your point of view) the straight line through and the horizon point . And since it is visible over the horizon, the object lies "above" the tangent line passing through your view point and the horizon point . 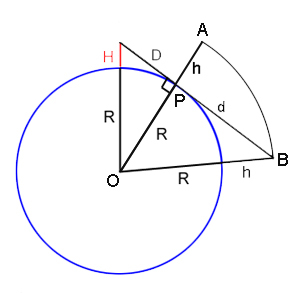 Thus the object lies somewhere on the arc of the circle between points and (see the diagram on the right). We have already worked out that for a person of height , we have and we know that So for a maximum height of we get that the object is at least away from you.